Torn or worn stitching in lightweight leathers can be repaired easily with sewing equipment you can buy at any fabric or department store. Items like chaps and half-chaps, flash nosebands, saddle pads, blankets can be a do-it-yourself repair that takes minimal time and expense. These things are nice to have but not essential. They make the job a bit easier and safer. Wax helps stitching last longer. Trim away any loose and frayed thread. Clip any loose ends so they are flush with the leather or fabric you are sewing. The thread has unraveled and frayed and I am clipping it away, being careful not to accidentally cut the leather or the zipper. Measure out about 2 feet of thread. A longer thread will be too easy to tangle and shorter will be harder to work with. Thread a needle on each end of the thread as pictured. If the thread is not waxed, you may want to run the thread along the wax of an old candle to stiffen it​ and make threading easier. Just be sure to use plain white wax. Colored wax might show. Begin sewing by inserting the first (either one, just choose) needle through a stitch hole about an inch (2.5cm) behind the area you are replacing so that your new stitching anchors over the existing stitching. 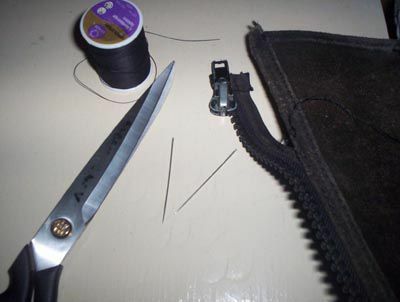 Pull the thread tight so that you have an equal amount of thread on each side of the leather and a needle in each hand. The thread will need to be pulled snuggly, to avoid any gaps in the seam you're sewing. Insert a needle through the next stitch hole. You will always be putting the needles into existing stitch holes, not piercing the leather to make new holes. Pull the needle through. You will now have both needles on one side, with one thread behind the other. If you find it difficult to push the needles trying protecting yourself with thimbles or use a "palm". Thimbles you'll find almost anywhere you can buy fabrics and palms are available through leather craft retailers. Leather or plastic thimbles might not cut it for this work. Pass the second needle through the same hole that you passed the first needle through. The needles will now be on opposite sides again. Continue to pass the needles back and forth through the stitch holes until you reach the end of the missing stitching. When you reach the end of the repair anchor the end of your threads by stitching back over the existing stitching. This back-tacking eliminates the need for knots that may come undone. If your thread runs out before you finish your repair, begin back at Step One, anchoring your thread about an inch (2.5cm) back into the existing stitching. Clip the ends of the thread very close.